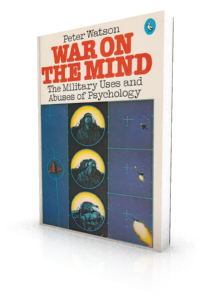 An account of the psychological research – much of it secret – carried out by military authorities in America, Britain, Israel, Australia – even Russia – during the Cold War and the Vietnam War, in fields such as interrogation, torture, riflemanship, sabotage, propaganda, tactics. After it was published, it became required reading in the Pentagon. "Mr Watson’s original work is … a step in the direction of sanity, deserving of the widest possible reading." "This impressively researched book, which is likely to become indispensable reading to anyone concerned with the growth and implications of military technology … is warmly to be welcomed."